There’s a lot of great history in The Pixar Story but part of the third act feels more like a rehash of supplemental materials from Pixar’s DVDs. Making documentaries about filmmaking isn’t as easy as it used to be, particularly when the documentary focuses on one particular filmmaker or boutique studio. The problem is that so much material is readily available on DVDs, finding fresh content and a new angle is harder. As a recent example, Lynchis a documentary about David Lynch set around the making of Inland Empire. The DVD forInland Empireincludes a supplement calledLynch 2, which is 30 minutes of documentary footage not used in the feature-length doc. Surprisingly, the moments captured on the DVD are more informative and entertaining than most of what is found in the feature documentary. The Pixar Storysuffers from a similar problem. The first two-thirds are great. They depict the struggles faced by the likes of John Lasseter, George Lucas, and Steve Jobs as they toiled with launching the world’s first feature-length computer-animated movie. It’s all here. Those beginnings at California Institute of the Arts, with stories about Disney’s “Nine Old Men” coming out of retirement to teach Lasseter, Brad Bird, Tim Burton and others about the fine art of animation. There are the really early experiments that wound up inFutureworld, the Tronturning point, the big leap forward with the Project Genesis animation in Star Trek II: The Wrath of Khan, which eventually led to the massive accomplishment of bringing a stained glass knight in shining armor to life in Young Sherlock Holmes. There’s also that Luxo lamp that became a Pixar fixture as part of the company’s logo. The Pixar Story nicely pieces together all those early elements, including the technology put to use in Rescuers Down Under, Beauty and the Beast, and Jurassic Park, all those obscure, sometimes small, sometimes huge steps forward that ultimately led to Toy Storyand a certifiable animation revolution. While watching The Pixar Story, there is the distinct feeling that one small difference in choice for the worse and BOOM there would be no Buzz Lightyear, no Nemo, no Mr. Incredible. Such was the tightrope walk that the founders of Pixar were treading. What if Lasseter hadn’t been fired after unsuccessfully pitching a computer-animated experiment called The Brave Little Toaster? With that door closed, a new one opened at Lucasfilm. What if Jeffrey Katzenberg hadn’t pushed for “edginess” in Toy Story? Or if those early, attitude-laced treatments o fToy Story were deemed really good instead of in major need of a rewrite? There are so many hypotheticals like those in Pixar’s development that it fairly boggles the mind how well things fell into place — after ten years of angst. Thankfully, Toy Story turned out to be a true modern-day classic. Followed by A Bug’s Life, the house that Buzz built seemed on sure footing. But then Toy Story 2 started going drastically, rapidly in the wrong direction and Lasseter quickly returned to the helm and reversed course, remarkably rewriting and retooling the sequel in a mere nine months. Following the massive success of those back-to-back-to-back Pixar movies, the movies each received stellar DVD treatment that at points veered into the territory of “too much information.” In some of those supplemental features and in The Pixar Story there’s a sense that working for Pixar is not for everybody. It takes a sincere, unadulterated obsession with film and animation to regularly, extensively work those wee hours in front of a PC. But that’s where The Pixar Story also meets its biggest problem. Once Toy Story 2 is released, there’s a sense of self-awareness that squeezes the fun from the documentary’s first hour. It’s as if that was the turning point wherein Lasseter and Co. realized every little thing they did would be deemed historic and a collector’s item of some sort. All of a sudden, it’s about popping champagne bottles at the spiffy new Pixar HQ and announcing the opening weekend box office results for Monsters, Inc. And, shoehorned into the mix, there’s a laborious few minutes looking at some minutiae while making Finding Nemo. That bit feels forced, as if it’s there simply to flesh out the documentary’s running time. While the third act falters, director Leslie Iwerks (the granddaughter of Ub Iwerks, Walt Disney’s first employee in his animation venture) manages to close things out with an interesting, albeit very brief, look at the reversal of fortune faced by the animation industry at large. 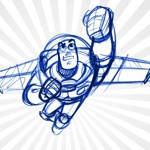 While Disney passed on Lasseter’s early tinkering in computer-animated features, the whole industry had since gone on to focus strictly on computer animation in the wake of Pixar’s unprecedented success. Traditional hand-drawn animation studios were shutting down following expensive flops like Atlantis: The Lost Empire (from Disney), Titan A.E. (from Fox), and The Road to El Dorado (from Dreamworks). Ah, but everybody should know by now that it’s not the style of animation that makes the millions upon millions at the turnstiles, it’s the amount of heart and the stories that make those Pixar movies work so well. With that, The Pixar Story ends on an optimistic note, ironically enough, about the return of hand-drawn animation as Disney buys the hand that fed it some of its biggest hits. But this time, with those upstart Pixar boys moving over to run the Disney animation ship, it looks as though what was old will once again, one day soon, be new again.